A photographer who lost his vision, found it again and became an artist. "Buying expensive frying pans, does not make you a good cook; buying expensive cameras does not make you a good photographer." "Gear does not matter, it's vision that counts." I guess, we all heard such phrases already. I usually reply similarly when I'm getting asked which camera I own. But now, I realized something way more important. For more than 6 years, I shot with a Canon EOS 600D and was absolutely satisfied and not thinking at all about the so called "upgrading" - whatever that means. Unfortunately, my year-long friend, I'm talking about the 600D, broke on a hike through the Norwegian fjords. Since I was only for a limited amount of time in Norway, I quickly decided to pick up a used Canon EOS 7D, to just continue shooting and have some kind of more durable camera body. But soon, I had to realize how heavy and bulky this camera is. Although I hiked and travelled with the minimal gear possible (7D Body + Sigma 17-55mm F2.8 + Tripod + Filters and some other small gadgets) my backpack became already quite heavy. Adding outdoor gear such as a tent, clothes and other things, I often carried 15kg or more on my back. Not much fun on 22km hikes. The worst though was the fact that my camera was too heavy to carry it in my hand or around my neck. Consequently, it was inside my backpack. And that brings me to one of the main points of this article: I missed out on shooting! I could not capture the moment and shot less than I wanted. It was just too complicated to take off the backpack to dig for the camera. Long story short: The camera was just too heavy and bulky. (And it was not even as heavy as full-frame gear). On my trip to Iceland, I faced another problem: Water condensation inside my lens and body. That was the moment when my friend and I realized that my camera does not fit my needs. So we summarized my gear needs: The camera has to be small, light, weather-sealed and have a big dynamic range. The answer to that was pretty simple: Mirrorless. But now, Sony or Fujifilm? In Reykjavik, we visited several camera shops and compared only the size of Fujifilm cameras to the Sony cameras. We realized that Sony's gear is still quite big and heavy, although mirrorless. And somehow the Fuji just felt right. You just need to follow your instincts as a photographer. I'm really a guy, who does not worry about gear too much, besides the already mentioned needs. So I made my mind and bought a used Fujifilm X-T1 and a used Fujinon 16-55mm R Lm Wr. At that time, I did not know what a huge impact that decision will make on me growing as a photographer and that I would call myself even an artist a few months later. Now let's have a look on my photographic (7D) and my artistic shots (Fuji). Those pictures are nice, but not creative. Simply said, it's a documentary of sunsets and images pushed up to their limits. And I pushed it so far too the limits that I even pushed out my soul and heart, seeking for absolute sharpness, the lowest noise but strongest colours and contrasts possible. But honestly looking at them, I realize now that they are just static shots taken from a tripod with HDR bracketing and nearly oversaturated colours. No big vision or personality. It was hiking and waiting/ hoping for good weather. Landscape photography led me to beautiful places and gave me unforgettable experiences, I really appreciate it and spread out those stories with my heart and soul. But it also dulled my creativity. Basically, landscape photography is travelling to a place, every landscape photographer travels to, waiting for the right weather. But in the end it is always a similar shot just slightly different. All over again the same subjects from nearly the same perspective. Why else are 500px and Instagram cluttered with landscape shots from Kirkjufell or Skogafoss in Iceland, Reine at Lofoten in North Norway, Marina Bay in Singapore, Mount Fuji in Japan with the temple in the front and so on and so on. It's always the same. I felt good at it, but it just started getting boring. Fujifilm X-T1 - Moments, emotions and creative angles. Would you imagine that the same person would have shot both of these sets? I don't think so. The styles are so drastically different. 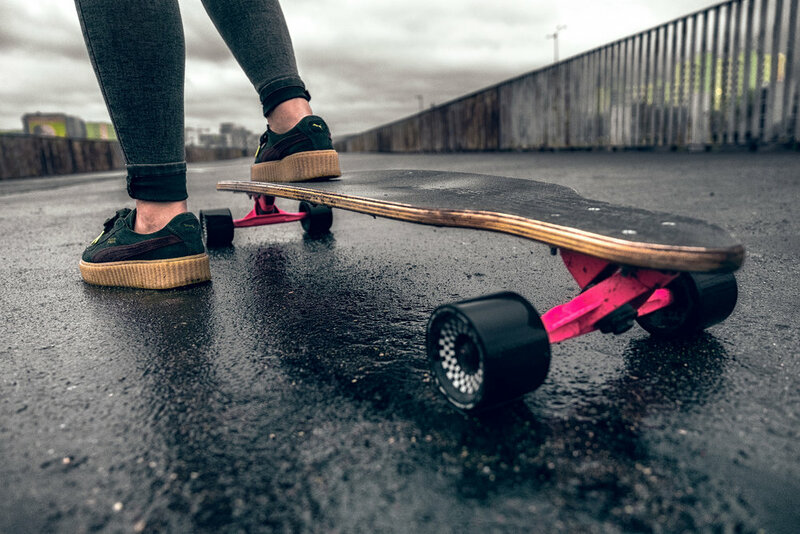 From super shiny happy travel pictures, to pictures with grey overcast skies, skateboards, girls laughing, dreamy bokeh and other beautiful moments. They have much more soul than the "high quality tourist shots" I took before. Do you agree? I am not claiming to make a full camera review. There might be other factors to take into account. I just outline the features that made a huge difference for me. - Light, small: 440g Body - Lens: 657g = 1097g. Always in my hand or around my neck. Small and handy for traveling and being less recognised when shooting on the street. - Menu: No need for going into the menu. Everything I need can be programmed and handled by the dials on top and on the lens itself with direct access and without complicated button combinations. - Intuitive: YES! After shooting with it for 3 months I feel perfectly confident in most of its functionalities. - Wifi: Yes + Remote control app for mobile phones (free). - Heavy, bulky: 860g Body - Lens: 565g = 1.425g. Always on a tripod, too big for my hands, to heavy for traveling. - Menu: Always browsing through menus for HDR bracketing. Buttons everywhere reacting differently depending on the automatic you are in (AV, TV, M). - Intuitive: Not really for me. I shot with that camera for 5 months and still got lost in it, although shooting with another Canon camera for 6 years. I would expect more after such a time. Both cameras as my personal "travel kit". *Thanks to http://camerasize.com/ for these nice comparisons. My Fujifilm X-T1 in a blizzard. Looking at the size I think it's obvious that the Fujifilm fits my personal preferences way better than the Canon EOS 7D. It's always way smaller and lighter than the Canon, although the Fujinon 16-55 is undoubtably a really heavy and huge lens. But still the body is smaller and I can reach any button without any problem and can shoot one handed. I guess, it's not necessary to see the winner size-and weight-wise, when screwing on the 23mm lens. the Fujifilm X-T1 It just gave me the freedom of walking around again, not having to worry about the gear to break in snow or drizzles. Instead, I had a camera i could handle completely by dials on the top even wearing my winter gloves, not having to fumble through any menu: Straight-forward, direct, quick, uncomplicated and just intuitive. ISO, Shutter speed, exposure compensation and aperture are directly available through physical dials. Also high-speed shooting and bracketing or other camera modes as well as metering systems are directly available. Fujifilm mastered it to create a camera in which I do not have to use the menu inside the camera anymore. Instead, I can focus on the moment, the model, my environment and start living photography again. I also missed the tilting screen from the Canon EOS 600D on my 7D. I also wish that Fujifilm will implement a completely flippable screen, but for now Fuji found already another geeky solution: The remote control app. Just connect your phone with your camera via Wifi and adjust all settings (aperture, shutter speed, ISO) via phone and press the shutter. Then you can also take a selfie standing away from your camera. To be honest, it is still quite buggy though and sometimes the reach is rather small. But it is a first step into the right direction. Focus peaking is also a functionality of big importance for me. As you could see, more and more people came into my frame. And I never, really never mis-focussed. Focus peaking is the technology of the future. Simply said, the camera's display highlights areas in a colour of your choice showing either the highlights or shadows you focus on. That way, you can see directly through your viewfinder, which is by the way the same screen as your screen on the backside of the camera, which areas are in focus. I have heard very often about it, before I decided to purchase a mirrorless camera, but I really underestimated the power and accuracy. Another tool to enhance your confidence and reduces your worries while shooting. Without this fantastic technology of Fujifilm, I would not feel confident in my portrait photography. I don't want to go too deeply into gear reviews. You can read that somewhere else much better than in my post. I am not specialized in gear reviews. I just want to express how this camera helped me grow as an artist by giving me back my lost creativity. I'm going out to shoot nearly everyday. It fulfills me with pure pleasure. I think, it also reflects in my photos. First of all, I want to outline clearly that it's possible to shoot both kind of pictures with both kinds of cameras. I am not saying Canon is worse than Fujifilm or vice-versa. It's also possible to change your photographic style without changing your gear. The most important thing I want to share is: Don't buy a camera, because it is expensive, don't buy a full-frame just because someone told you it is "professional". Buy a camera that suits you! My gear restrained me for too long. I'm back where I started my photographic journey nearly 10 years ago: I'm going out and just do what I love, just now in better quality than 10 years ago. Photography is too important in my life to just keep watching how I'm losing my creativity, caused by unsuitable gear. I want to live photography and feel alive in it. When I had my Canon 7D, I realized quickly it does not suit me, it's not light, not small and not weather-sealed. But I was paralyzed and was afraid of change. But Fujifilm made it surprisingly easy to quickly adapt to a completely new camera system. I even do not have to stop down my lens, I can just shoot widely open on F2.8, get a beautiful bokeh, no chromatic aberration and just classic film noise, not just digital grain, because the low- light performance of the DSLR camera is bad. In the past, I cleaned my pictures up, reduced any kind of noise, but these times are over. Who tells you, what's a good or a bad picture? It's not the amount of grain, it's the composition and the heart you put into your work. Of course, technical knowledge and post-production are significant as well. But if you shoot bad pictures or have a bad attitude while shooting, no software in the world can fix that. And now I love my pictures for having this nice film grain and film look. There is also one secret to my new style: The Fujifilm X-T1 has implemented film presets which you can apply in Lightroom or raw- converter of your choice. I learned to love the Classic Chrome preset, which desaturates the picture, brings in more blacks and just gives you a good start-off for emotive pictures. But the biggest secret is: If you don't feel comfortable with your camera, don't be afraid to change it. By the way, I still stick to APS-C. I would recommend thinking about changing camera manufacturers instead of joining discussion or thinking about "fullframe or not". If you want to change your gear, go for the big change. The slightly bigger sensor won't make a difference anymore. Since I bought the Fujifilm X-T1, I only once merged and uploaded an HDR. But I realized quickly that it is absolutely not necessary. The dynamic range of this sensor is so immense, as well as the file sizes, so that you can tweak them as never before. Even if you over- or underexpose some shots, the Fuji-files are very forgiving. You might have to get used to a different feeling in your raw processor, but also those small obstacles will disappear very quickly. If you are running out to the shop and just buy a Fuji X-T1, I definitely failed in transmitting my message. The message is: There is no such thing as "a camera to rule them all". But there are cameras that do not fit your needs and your style. Be honest to yourself, be courageous and find one that suits you. Don't waste time for being restricted by your camera. Your soul and heart have to form the picture, not the camera.